This is where I spent much of the summer 19 years ago. We had no cell phones, e-mail, internet, texting, or the like. I call it Hidden River in my memoir. With 1 million people, it’s a two-hour car ride from Wuhan, the largest city in Hubei province. The summers were hot–as in 100F–and the winters damp and cold, just hovering above freezing. We had no heat in the winter and one air-conditioning unit in the summer, but only because of me. If it had been my choice, I would have chosen a heater over an AC unit, but no one asked me. I just went with the flow as much as I could. 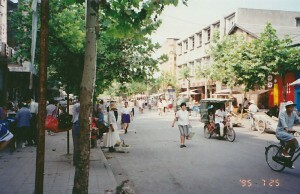 I went to Wuhan, Hubei in 2010. I like the bullet train that goes from Guangzhou up to there in 3 hours. It’s a decent second-tier city, modernizing well enough. I’m sure back in the 1990s it was completely different. Have you been back in recent years, compared? Very cool that you’ve been to Wuhan! When I was there, China had yet to have any bullet trains. I spent a parched 16 hours on an overnight train from Wuhan to Guangzhou once and never thought I’d ever get another sip of water. Aiya! I haven’t been back in almost two decades.